While trying to figure out the DNS issue this site was having last night, I ended up doing a little research for an upcoming post. One of the unsung benefits of being a spirits writer is that if you plan to write about what you are drinking, then you can just say you are doing "research." And the greatest part of that is, it isn't even lying. So since I was busy doing IT work (and doing research on future posts) last night, I thought that it might be a good time to finally get around to the third of three bottles of Limestone Branch Experimental Bourbon that I bought back in May. This one has a very similar name from the second bottle I reviewed. So much so that the reason that the reviews were written in the order they were was because I grabbed the wrong bottle when I did the second review. There is a single word of difference in the names. This one does not have the word Malted in it. Which of course means that this is a much more typical wheated bourbon mash then the malted wheat bourbon was. Limestone Branch Red Wheat Bourbon is a 98 proof bourbon distilled from a mash of 60% White Corn, 28% Wheat, and 12% Malted Barley. It is 22 months old. Details: 49% ABV. Single Barrel. Barrel 59. Mash bill: 60% white corn, 28% wheat, 12% malted barley. Barrel Entry ABV: 50.58%. Barrel Char level 3. Aged 22 months. Nose: Caramel, wintergreen, cardamom, and peach. Mouth: Caramel, brown sugar, mint, hints of baking spice. Finish: Warm and of medium length. There is an immediate "young" note upon swallowing which is followed by peach and baking spice. Thoughts: I have never had a peach note show up in a bourbon before, so for that, I find this really interesting. This shows a lot of promise, but sadly just isn't there yet. As they release older versions though, this will be one to keep an eye on. When I was a kid, Walt Disney's Bambi taught me two things. 1) The mom will always die in a Disney cartoon. 2) "If you can't say anything nice, don't say nothin' at all"
Details: 45% ABV. Processed using the TerrePURE fast filtering process. Bourbon: "Aged a minimum of a year and a day in new charred oak." Rye: "Aged a minimum of six months in new charred oak." Bourbon: Caramel Corn. Smells very young. Rye: Buttered corn initially. A hint of rye spice appears after a bit. Bourbon: Gentle spice (mostly alcohol tingle), Sweet corn. Rye: Thin and cool in the mouth. After holding it in the mouth for a while, rye spices appear. Slightly sweet with a hint of citrus. Bourbon: The finish really reminds me of the sips of Seagrams 7 and 7-up that I'd steal from my dad as a kid. Thin, grainy and just a bit longer than you'd hope for given the flavors. Rye: Gentle and short with hints of rye spice that fade quickly. Thoughts: It is my understanding that most of the TerrePURE whiskey is being either sold as bulk whiskey or bottled as store brands. Given that, you can be sure that it will end up in plenty of private labels near you. I know that Total Wine has multiple of their own brands that are made from TerrePURE whiskey. I've tried a couple. I haven't found one yet I could recommend. I bought this thinking that since this was a brand being released by the producers, that it might be a good representation of the best that they could do. I still decided to only risk $4. If this is representative of TerrePURE whiskey, then "Distilled in Indiana" will become the mark to look for on unknown bourbon instead of "Distilled in Kentucky." This bourbon gives Kentucky bourbon a bad name. Luckily most of the TerrePURE whiskeys I've had have been labeled as such. But maybe we should avoid all store brand Kentucky bourbons, just in case. And in case it wasn't obvious, I really do not like this. At all. The rye is pretty meh. It's light on rye flavor. Doesn't have the punch you'd expect from even young rye. But, hey, it is much better than the bourbon. So there is that. Have you ever been so busy that you just forget to eat? You wouldn't know it from looking at me, but it happens to me all the time. I'll get so into working on a project that all of a sudden I'll look up and it's four in the afternoon...and it's right about then that I realize that I am really hungry and end up eating a little too much to compensate. This is the probably the reason you wouldn't be able to tell that I frequently forget meals. Anyway, that's the sort of passion that I expect most craft distillers have. Not the gorging after unintentional fasting part, but the getting so into a project that you forget about everything else part. The distillers that I've met have all really loved what they are doing and loved the experimentation that they could do. Which brings us to the second of three bottles of Limestone Branch's Experimental Collection that I picked up in May. This one is named Malted Red Wheat and is made up of a mash bill of 60% white corn, 28% malted wheat and 12% malted barley. Details: 47.5% ABV. Single Barrel. Barrel 114. Mash bill: 60% white corn, 28% malted wheat, 12% malted barley. Barrel Entry ABV: 50.63%. Barrel Char level 3. Aged 20 months. Nose: Toffee, floral, gentle baking spices. Mouth: Generic Sweetness, malted milk, cinnamon spice. Finish: Youth shows up on the finish bringing cinnamon spice and dried grain notes along with it. Thoughts: I have a feeling that when it grows up, I will like this much better than the first bottle in the series that I reviewed. For right now though, this one is quite a bit too young for my palate. What happens when you try to make a bottle of your whiskey look like a bottle of Jack Daniel's? You get sued. That's what happens. In other words, Jack Daniel's sued Lonehand and their owners for infringement and then called them lousy whiskey on top of it. I find that funny as hell. So of course, I had to buy a bottle. I mean, not a full bottle, that would be silly. No, I bought a 50mL bottle. Trying bad whiskey is my idea of an extreme sport, it's something I do just for the experience. But it's not like I'm about to jump off this particular cliff more than once, so I did not need more than 50 milliliters. But all this talk of lawsuits makes one wonder why anyone would think that taking on Jack Daniel's is a good idea. Maybe they read the history of Ezra Brooks, a brand that did the same thing back in the late 1950s and is still around today. In any case, I don't know if it means anything but the website for the brand owner is not working as of this writing, so maybe the odds aren't great that Lonehand will be the next Ezra. But what do I know? Maybe in 20 years, Sipp'n Corn will be writing a post about how Lonehand took on Jack and survived. Mouth: Spice at the beginning that fades quickly. Dried grains, slight sweetness as it moves back. Thoughts: Hard pass on this one from me. It's not terrible, but there are better Tennessee whiskeys out there. And if the price is the issue, there are also better and cheaper bourbons out there. I woulnd't bother with this one. When I was first getting into cocktails, I read everything I could on how to "up my cocktail game." There was no shortage of listicles telling me what 10 things to try and what 10 things to avoid. And on almost every list were cherries. List makers of the late aughts and early teens were terrified that someone might use a grocery store Maraschino Cherry in their cocktail. And at the time, the fear was probably well founded. There were not a lot of pre-made cocktail cherries on the market that weren't Glowing Red Neon Balls of Dye and Sugar™. Of those that were suitable for grown-up cocktails, Luxardo was the brand that was recommended the most. 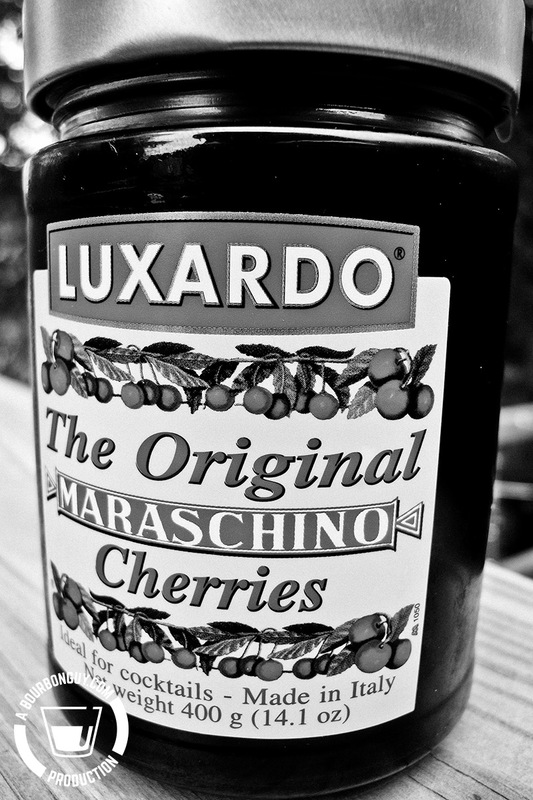 Unfortunately, Luxardo Maraschino Cherries run almost twenty dollars a jar so, for the longest time, I just omitted the cherry garnish. But my reading led me to believe that the syrup surrounding the cherry made more difference to the drink than the cherry itself and that by omitting it, I was actually losing flavor. So being a DIY sort of guy who loves to cook, I devised my own recipe for cocktail cherries. Sure, they probably ended up costing more than the store-bought, but I had much more than $20 worth of fun making them. And I got a lot more than a 16-ounce jar for my effort. I made a lot of versions. Two of them were good enough to write about: Chocolate-Bourbon Cocktail Cherries and Orange-Spiced Cocktail Cherries. The latter being my personal favorite and our current go-to cherry for whiskey cocktails. But last year, I couldn't find the materials to make any homemade cherries. So I've been buying them this year. I previously reviewed the Woodford Reserve Cherries from Bourbon Barrel Foods and found them to be a good, if lesser, substitute for my own cherries. This time around I thought I might finally give the original a try. See what all those listicles were talking about. Thoughts: The syrup these cherries are packed in is pretty damn good for adding a delightful cherry note to your cocktails. But, the cherries themselves are very disappointing. They are certainly a step up from Glowing Red Neon Balls of Dye and Sugar™ but they are the possibly the worst of the cocktail cherries I've tried if you are a grown-up and want to actually eat the cherry in your drink. The skins are tough and sticky and the insides are mush. If I were to recommend a cherry for your cocktail, I'd recommend making your own. If you'd rather buy them, go with the Woodford ones from Bourbon Barrel Foods. I'd give these a pass. In fact, I'm actually considering tossing the cherries and just keeping the syrup.